Tile that looks like wood, wood look tile, wood tile planks- What exactly is Wood Plank Porcelain tile? 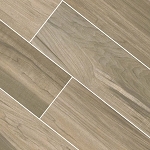 Wood plank porcelain is tile that looks like wood, but is made from porcelain. With wood plank porcelain tile, you can enjoy the beauty of a floor with a hard wood aesthetic, but with the easy care of porcelain tile. Because of the somewhat exhaustive maintenance required with hard wood floors, wood plank porcelain tiles have become a popular choice in homes today. Wood plank porcelain tiles are desired for both their durability and their beauty. Porcelain is created by compressing clay dust mixed with a water solution into tile molds and the result is a material that is much more dense, and tougher than the average ceramic tile. Unlike hardwood flooring, wood plank porcelain is much more difficult to chip and scratch. 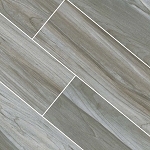 Because porcelain is man-made, there are endless styling options in terms of color, size, shape, etc., to make a beautiful tile that looks like natural wood. With all of these options, it will be easy for you to find the perfect wood plank porcelain for your home. Because of wood plank porcelain's high durability, it is a tile that is able to be used both indoors and outdoors. Flooring: Many desire the look of hard wood floors but do not feel comfortable with the extensive upkeep and care. Wood plank porcelain flooring is the perfect solution as it looks impeccably like hard wood but requires the minimal maintenance of porcelain tile. Wood plank porcelain tile can be used as flooring for any room in your home. Backsplash: Create a unique focal point in your kitchen with a wood plank porcelain backsplash. Shower wall: A wood plank porcelain shower wall is the perfect upgrade for any modern or rustic bathroom. Accent wall: Because porcelain is one of the lightest weight tiles, wood plank porcelain tile is an excellent choice for an accent wall in any room of your home. BBQ: Give your outdoor bar-b-que some character by tiling it with wood plank porcelain tiles. Outdoor bar: Add a little elegance to your outdoor bar design by adding wood plank porcelain. 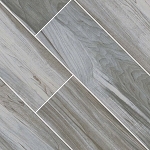 Walkway: Whether it's a walkway through your garden or a walkway in an industrial area, wood plank porcelain is the ideal tile choice with its many finish options. Patio: A wood plank porcelain tile floor on your patio is a great fusion of indoor and outdoor.